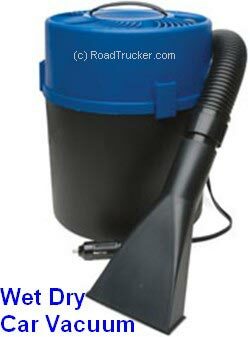 This Super Wet Dry Car Vac gets the job done right the first time! Never a need to replace vacuum filter bags. Gets into cracks and crevices for a clean you can count on every time. The Super Wet Dry Car Vac Plugs into Your Cigarette Lighter Socket. RoadPro's compact canister vacuum is the answer for on-the-go spills. Just plug this little powerhouse directly into your vehicle's lighter/power socket, and it's ready to tackle even the toughest spills and messes. Plug the unit into your 12-volt cigarette lighter socket and reach the nooks and crannies of your vehicle's interior. Powerful 12,500 rpm motor and 17' power cord combined with a flexible hose and swivel cuff ensures optimum performance in your car, truck, camper or boat. Attachments include a carpet tool for detailing, an upholstery brush for lint and hair, and a crevice tool for the hard to reach nooks and crannies. Another great innovation from RoadPro, your trusted travel companion, providing everything you need for on-the-go living.